Students at The Computer School in New York City learned first-hand that the Hudson River may not deserve its grimy reputation. 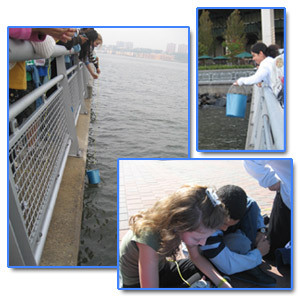 On a crisp, sunny October Day, sixth and seventh graders walked from their school to a pier along the Hudson River. Led by ACES teachers Ms. Rives and Ms. Butler, students were eager to get a little wet as they conducted scientific testing on their local estuary. The Hudson River is a combination of both fresh and salt water - brackish. At its headwaters in upstate New York, it is a freshwater river. The southern part of the Hudson is more salty. The amount of salt in the water - its salinity - changes with the tides. This estuary is an important habitat for many marine animals including fish, such as seahorses, sturgeon, carp, and striped bass; birds, such as egrets, bald eagles, and herons; and even occasionally marine mammals tracked by ACES scientists, such as harbor seals and harbor porpoises. Many New Yorkers believe that the Hudson is dirty and polluted. While the river has a long history of terrible pollution upstream, water quality has improved tremendously in recent years. ACES Students at The Computer School were surprised to learn just how much! Students took turns collecting river water with buckets and then using thermometers, turbidity tubes, and special kits to measure different parameters. When they measured turbidity, students found that the water was quite clear, and nitrogen and phosphorus levels along with pH were all in the normal range. Back in the classroom, students calculated the average readings and then entered their data on the ACES National Water Study Map! To have your school join the National Water Study, click here.